The name Rockefeller resonates with wealth. In 2016, the oil-rich Rockefeller family ranked 23rd on the Forbes list of America’s richest families with a net worth of $11 billion. What is much less known about the Rockefeller’s is their philanthropic mission to pursue a cultural exchange between Asian and American artists. 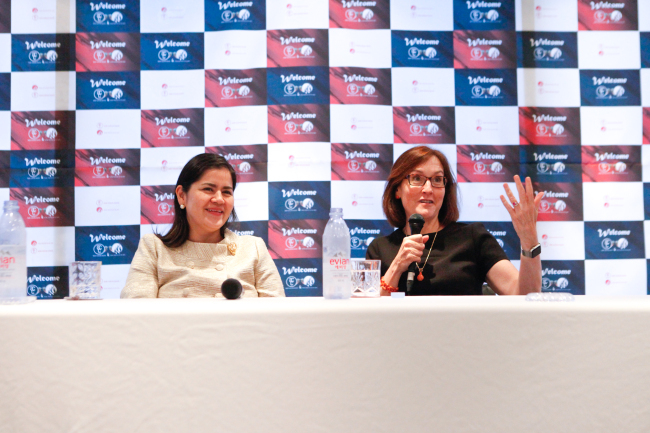 Wendy O’Neill, a fifth-generation Rockefeller, expressed her wishes to increase philanthropic support for Korean artists at a press briefing held in Namsan Art Center in Seoul, Monday. “There are artists of great quality in Korea. We currently give one to three grants a year to Koreans and that’s not because there aren’t enough good artists, but because of limited funding,” said O’Neill, who is the chairman of the Asia Cultural Council, a grant-making and grant-sourcing organization for artists that promotes inter-cultural exchange. The ACC grant originated from the Asian Cultural Program of the John D. Rockefeller III Fund in 1963, and has been received by nearly 150 Korean artists since. Many well-known Korean artists were given ACC grants, starting with the renowned Korean painter Kim Whan-ki in 1964 and the pioneering video artist Nam June Paik the following year. O’Neill stressed that the ACC grants are also given to emerging and mid-career artists. In order to be selected for a grant artists have to prove their openness to new experiences and show how critical the grant is to their career. The ACC plans to expand its supportive reach by securing more partners and donors, O’Neill said. O’Neill visited Korea to give the John D. Rockefeller III Award to Yoo Duk-hyung, president of the Seoul Institute of the Arts, which is currently the sole partner of the ACC. Yoo received an ACC grant in the early stage of his career. He is the first Korean to win the prestigious John D. Rockefeller III Award for contributing to the international understanding of the Asian art.